The two prime ministers attended the celebration of the upcoming 40th anniversary of diplomatic relations between the two countries and "Chinese Cultural Year" activities. The two countries signed eight cooperation agreements. in October 2010 in Istanbul. During the visit of Chinese Premier Wen Jiabao to Turkey, the Chinese Prime Minister met with Turkish President Abdullah Gul and Prime Minister Recep Tayyip Erdogan. China and Turkey issued a joint declaration on the establishment and development of a strategic relationship of cooperation, further upgrading the level of bilateral relations. Wen also had talks with representatives from the Turkish cultural and business communities. Beginning on October 27, the Turkish FM Ahmet Davutoğlu will pay an official visit to China to initiate tangible steps in line with 8 agreements signed in October 2010. Davutoğlu will travel to Beijing, Kashgar and Urumqi. The week-long visit to China between Oct 27 - Nov. 2, is expected to be the key to developing bilateral relations and cooperation, goals that have been declared when agreements were signed between the two countries. As part of his visit Davutoğlu is also going to attend the closing ceremony of EXPO 2010 in Shanghai and visit the Turkic Uighur-populated region and Qashqar regions, the Foreign Ministry said in a statement on Friday. Prime Minister Recep Tayyip Erdoğan announced Davutoğlu's visit to China following talks with Premier Wen Jiabao on Oct. 8. Exchanges between the lands of China and Turkey began more than 2,000 years ago as a result of the ancient Silk Road. Since the establishment of diplomatic relations on August 4, 1971, modern-day Sino-Turkish exchanges increased, especially during the 1980s, leading to enhanced bilateral trade relations. Turkish President Kenan Evren visited China in December 1982, the first visit to Beijing by a Turkish head of state. 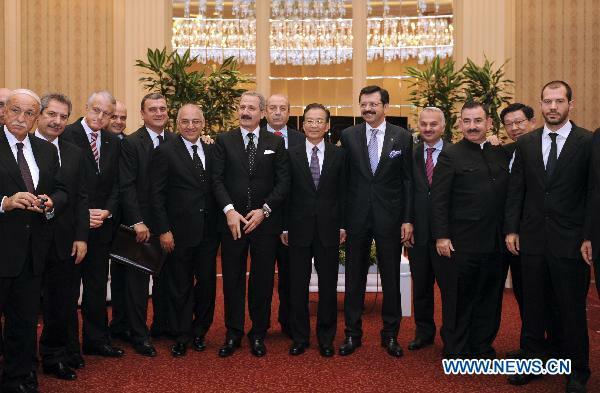 Three years later, Prime Minister Turgut Ozal visited China. Reciprocal visits to Ankara were made by Chinese President Li Xiannian in March 1984 and Premier Zhao Ziyang in July 1986. Other Turkish leaders who visited China include President Suleyman Demirel (May 1995), Speaker of the Grand National Assembly Necmettin Karaduman (October 1985), and Speaker of the Grand National Assembly Mustafa Kalemli (August 1996). Most importantly, when President Jiang Zemin visited Turkey in April 2002, the two countries signed a joint communiqué regarding increased bilateral cooperation. After the visit of Turkish President Abdullah Gul and a large group of businessmen and state officials to China in June 2009, Li Changchun, a senior official of the Communist Party of China (CPC), arrived in Turkey in April 2010 for an official visit in the company of a delegation of 100 high ranking businessmen. Both nations have been seeking to improve economic and commercial relations and to create opportunities for companies to establish new partnerships. As of 2010, Turkey and China have a trade volume of more than $ 15 billion. 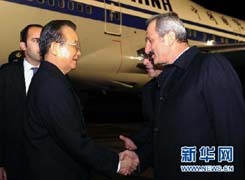 The Oct. 2010 visit by Chinese Prime Minister Wen Jiabao to Turkey is expected to boost relations to a new level. China and Turkey intend to raise their trade to $50bn by 2015. Both China and Turkey are members of the G20 group of rich and developing countries. Turkey and China, which have two of the fastest growing economies in the world, announced earlier in October 2010 that they aim to treble bilateral trade to $50 billion a year by 2015, and to $100 billion by 2020 under a new "strategic partnership." Currently, bilateral trade of about $17 billion is made up mostly of Chinese exports to Turkey. Turkey wants to rebalance trade with China through more Chinese investments in Turkey, Chinese tourists, joint ventures in third countries and more access for Turkish goods in China. 2012 to be "Year of China in Turkey" 一 2013 to be "Year of Turkey in China." Chinese Premier Wen Jiabao will pay an official visit to Greece, Belgium, Italy and Turkey from October 2 to 9. Wen will also attend the 8th Asia-Europe Meeting (ASEM) and the 13th China-European Union (EU) summit from October 4 to 6. Wen will attend events celebrating the 40th anniversary of diplomatic relations between China and Italy. Chinese Premier Wen Jiabao's four-nation Eurasian tour has scored marked achievements and further deepened China-Europe cooperation, said Foreign Minister Yang Jiechi, who described the visit as "a great complete success." Wen paid official visits to Greece, Belgium, Italy and Turkey and attended the 8th Asia-Europe Meeting (ASEM) and the 13th China-EU summit in the eight days from Oct. 2-9. Yang said Premier Wen's visit is aimed at boosting mutual trust through dialogues and promoting common development through cooperation. During his eight-day visit, Wen took part in more than 70 meetings, events and activities and paid a brief visit to Berlin as a guest of German Chancellor Angela Merkel in the midst of his stay in Brussels. In addition to talking with leaders of the four countries and the European Union (EU), Wen also met with people from the local cultural, industrial and business circles and held joint press conferences or issued joint statements together with the leaders of the countries. Premier Wen vividly presented China's policies and positions, trying different angles, Yang said, which had further improved bilateral relations between China and the four countries and deepened China-Europe ties in the new historic period. Yang said Premier Wen's visit to Turkey is of great significance to the bilateral relations that have had a tradition of friendly ties. Turkey attached great importance to and had been looking forward to the landmark visit, which further consolidated the bilateral cooperation and turned a new chapter in the bilateral relations. 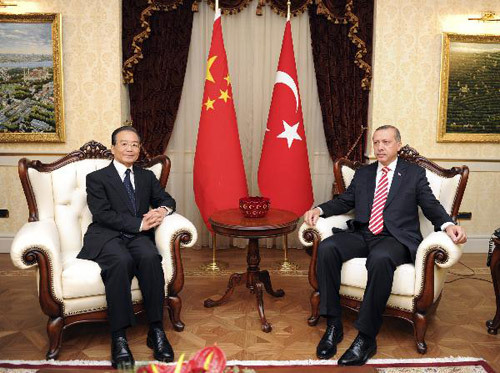 Premier Wen and Turkish leaders held in-depth talks and reached wide consensus. The two sides agreed to establish a strategic relationship of cooperation and issued a joint declaration, further upgrading the level of friendly cooperation in all fields and establishing a new milestone in the bilateral relations. Premier Wen's visit had a number of achievements, Yang said. The two sides agreed to further boost their cooperation in fighting the forces of terrorism, separatism and extremism and work together to safeguard their integrity of territory and sovereignty. The premier's visit further boosted bilateral cooperation as the two sides signed eight documents covering economy and trade, railway, power station, telecommunications and infrastructural construction. China encourages Chinese enterprises to increase investment in Turkey, make efforts to link the railway systems of the two countries, boost cooperation with Turkish side in finance, and promote bilateral trade with a view to sustainable and balanced growth. The two sides also agreed to further promote cultural exchanges. Premier Wen elaborated on China's policy of respecting cultural diversity while meeting representatives from Turkey's cultural and industrial and business circles. He also told the Turkish side that China would encourage Chinese tourists to travel to Turkey. The two sides also agreed to enhance coordination and cooperation in international affairs to promote peace, stability and prosperity, and promote bilateral cooperation. Premier Wen's successful four-nation visit is an important diplomatic tour to help boost mutual trust and do away with misunderstandings at a time of new international situations, and it will have significant influence on relations between China and the EU, China and Turkey, and China and Eurasian countries, Yang said. The Asia-Europe Meeting, or ASEM, has always been an important communication platform for the two continents. At the meeting, Premier Wen exchanged views and reached consensus on issues like global economic governance, sustainable development, international and regional issues and the cooperation process between Asia and Europe, Yang said. The latest ASEM was held amid a slow global economic recovery with a theme of "Quality of Life: How to Ensure Greater Prosperity and More Dignity for All Citizens." Russia, Australia and New Zealand were received as new members at the meeting, bringing the number of its members to 48. The meeting passed "the Chair's Statement of the Eighth Asia-Europe Meeting" and the "Brussels Declaration on More Effective Global Economic Governance," which express the will of the two continents to develop together and show mutual concern like the ones in the same boat. While addressing the eighth ASEM, Wen called the two continents to work together for the balanced and sustainable recovery of the world economy, push forward global economic governance and international financial system reform. He also called on the two continents to stick to the path of sustainable development and promote green growth. ANKARA-- China and Turkey on Friday issued a joint declaration on the establishment and development of a strategic relationship of cooperation, further upgrading the level of bilateral relations. The two emerging developing countries agreed to maintain the momentum of high-level exchange of visits, deepen political mutual trust, expand bilateral friendly exchanges and formally launch a mechanism of joint working group of the two foreign ministries, the declaration said. Chinese Premier Wen Jiabao was in Turkey for an official visit Thursday through Saturday at the invitation of Prime Minister Recep Tayyip Erdogan. During his visit, Premier Wen met with President Abdullah Gul and held talks with Prime Minister Erdogan. In a frank, friendly and pragmatic atmosphere, leaders of the two countries had an in-depth exchange of views on how to further expand and deepen China-Turkey mutually beneficiary cooperation in all fields and on regional as well as international issues of common interest, reaching broad consensus, the declaration said. The two sides made an overall review of and highly appraised the development of bilateral relations and expressed satisfaction over the fruitful achievements in the relations. It is the shared view of the two sides that as emerging developing countries, both China and Turkey are at an important stage of development, the declaration said. "With the historical background of deep and complex changes in the international situation, the continuous expansion of China-Turkey friendly relations and cooperation, both in scale and content, will not only benefit the two peoples, but also contribute to regional and world peace, stability and development," it added. -- Reiterate their adherence to the basic principles set forth in the Joint Communique on the Establishment of Diplomatic Relations between the People's Republic of China and the Republic of Turkey on Aug. 4, 1971 and the Joint Communique between the People's Republic of China and the Republic of Turkey on April 19, 2000. -- Establish and develop a strategic relationship of cooperation. -- Maintain the momentum of high-level exchange of visits, deepen political mutual trust and support each other on issues of core interest, further expand and deepen economic and trade cooperation on the basis of mutual benefit and reciprocity. -- Expand friendly exchanges between parliaments, parties and local authorities, push forward friendly cooperation in fields such as investment, energy, education, culture, sports, tourism, media, security, defense and transportation. -- Work together to safeguard regional peace and stability. -- Address all kinds of global challenges and push forward multipolarization and democratization of international relations, and deploy concerted efforts to build a harmonious world of enduring peace and common prosperity. -- Formally launch a "Mechanism of Joint Working Group of the Two Foreign Ministries" in 2011, and gradually enrich the mechanism in content and function, making it an important channel for strategic dialogue and consultations between the two sides. -- Exert their efforts to make the "China Culture Year" in Turkey in 2012 and "Turkey Culture Year" in China in 2013 a complete success. Visiting Premier Wen Jiabao and his Turkish counterpart, Recep Tayyip Erdogan, agree to explore all potential avenues to boost bilateral trade. ANKARA, Turkey - Visiting Premier Wen Jiabao and his Turkish counterpart, Recep Tayyip Erdogan, agreed on Friday to explore all potential avenues to boost bilateral trade. The two leaders met in Ankara, the Turkish capital, to sign eight agreements on infrastructure construction, telecommunications and bilateral trade. Erdogan said his country is seeking cooperation with China in building up to 5,000 km of railways in the coming years, with China already actively involved in a high-speed railway project linking Ankara with Istanbul. The Turkish prime minister set ambitious goals in increasing bilateral trade volume to $50 billion by 2015 and $100 billion by 2020. "This is a common target," said Erdogan, who added that concrete measures will be taken by both sides to realize the goals. Bilateral trade surged from about $1 billion in 2000 to $12.6 billion in 2008, although the figure dropped to about $10 billion in 2009 due to the global recession. Both sides have now agreed to carry trade in their currencies, Erdogan said. Facing common tasks of protecting national unification and territorial integrity, the two leaders also pledged to fight the "three evil forces" - terrorism, extremism and separatism. After the meeting, Wen announced ties between the two countries had been raised to the level of strategic cooperative relationship. "It's a milestone in the history of our bilateral relations," Wen told reporters during a joint press conference with Erdogan. "It will not only bring substantial benefits to people in our countries but also have profound effects on world peace and development." Turkey, a member of United Nations Security Council and G20, plays an important role in many international and regional issues, such as Middle East peace process and Iran's nuclear negotiations, the Chinese premier said. Yin Gang, an expert at the Chinese Academy of Social Sciences, said China and Turkey share a lot in common and have ample room to cooperate. "Both countries are climbing the global ladder to become economic powerhouses," he said. Wen flew to Istanbul on Friday, where he met Turkish President Abdullah Gul and representatives from Turkish business and cultural communities before traveling to Ankara. Turkey is the last stop on Wen's four-nation tour, which has taken him to Greece, Belgium and Italy. He also made an unscheduled stop in Germany. "We expect Chinese-Turkish ties to leap forward after Wen visits Turkey," Gong Xiaosheng, China's ambassador to Turkey, told reporters in Istanbul days before the premier's arrival. "As the two nations work more with each other, there will be a great prospect for cooperation," he said. China and Turkey have seen frequent visits of high-level officials in recent years, including Turkish President Gul's visit to China in June 2009. Around 50,000 Chinese tourists visited Turkey in 2008, with the number today exceeding 100,000. ANKARA, Oct. 8 2010 (Xinhua) -- China and Turkey on Friday issued a joint declaration on the establishment and development of a strategic relationship of cooperation, further upgrading the level of bilateral relations. The two emerging developing countries agreed to maintain the momentum of high-level exchange of visits, deepen political mutual trust, expand bilateral friendly exchanges and formally launch a mechanism of joint working group of the two foreign ministries, the declaration said. Chinese Premier Wen Jiabao was in Turkey for an official visit Thursday through Saturday at the invitation of Prime Minister Recep Tayyip Erdogan. 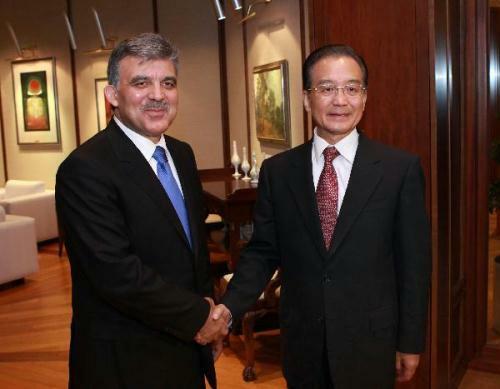 During his visit, Premier Wen met with President Abdullah Gul and held talks with Prime Minister Erdogan. In a frank, friendly and pragmatic atmosphere, leaders of the two countries had an in-depth exchange of views on how to further expand and deepen China-Turkey mutually beneficiary cooperation in all fields and on regional as well as international issues of common interest, reaching broad consensus, the declaration said. The two sides made an overall review of and highly appraised the development of bilateral relations and expressed satisfaction over the fruitful achievements in the relations. It is the shared view of the two sides that as emerging developing countries, both China and Turkey are at an important stage of development, the declaration said. "With the historical background of deep and complex changes in the international situation, the continuous expansion of China-Turkey friendly relations and cooperation, both in scale and content, will not only benefit the two peoples, but also contribute to regional and world peace, stability and development," it added. Prime Minister Wen Jiabao, the first Chinese premier to visit Turkey in eight years, said the new strategic partnership with Turkey “will be an important milestone and contribute to peace in the world.” Wen added that the two countries agreed to work together to establish a joint mechanism to fight terrorism and extremism, while also praising Turkey’s role in the Middle East and its “good offices” regarding Iran’s nuclear program. Following his discussions with Turkish Prime Minister Recep Tayyip Erdoğan, Wen traveled to Istanbul for a meeting with its influential business community. The two sides sought to reinforce coordination and cooperation in international affairs, to jointly promote regional and world peace, stability and prosperity, and to make China-Turkey relations a model of cooperation between emerging countries in the new era. The development of China-EU and China-Turkey relations, as well as China’s friendly cooperation with Eurasian countries, was another goal of the meetings. 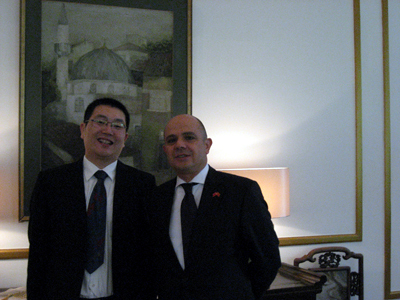 Ankara and Istanbul are two stops on Wen's visit to Europe, during which he also travelled to Athens, Brussels and Rome. In Brussels on October 6, Premier Wen co-chaired the 13th EU-China Summit, with President of the European Council Herman Van Rompuy, and President of the European Commission Jose Manuel Barroso. Wen said that the international financial crisis posed a challenge to the development of China-EU relations, adding that while the world is coping with the crisis, China attached great importance to strengthening coordination and cooperation with the EU. “We have agreed to raise our relationship to the level of strategic cooperation,” Turkish Prime Minister Recep Tayyip Erdoğan told a joint news conference he held with Wen. Turkey and China have set a timetable to reflect their growing ties in trade volume, which currently stands at $17 billion. Though the trade balance between the two countries is heavily in China’s favor, Turkish exports to China increased 62.8 percent in the first eight months of 2010 compared to the same period last year, reaching $1.451 billion. Turkish imports from China increased 37.9 percent, reaching $10.67 billion. · An agreement on railway cooperation. Prior to his departure, Premier Jiabao came together with Turkish State Minister Zafer Çağlayan and Turkish businesspeople in a meeting at the Conrad Hotel. Speaking at the meeting, Premier Jiabao said that the Chinese government wished to create a Chinese Investment Industrial Zone in Istanbul, or at another location in Turkey. At the same time, we will welcome a decision of the Turkish government to establish an industrial zone in Xinjiang (Xinjiang Uygur Autonomous Region), Jiabao said. China will provide the necessary financial assistance for mutual projects, Jiabao also stated. 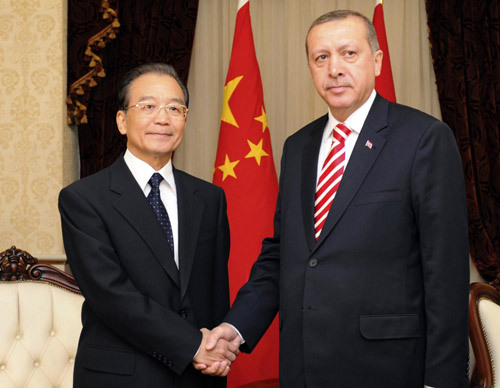 The October 2010 visit by Chinese Prime Minister Wen Jiabao to Turkey boosted relations to a new level. China and Turkey intend to raise their trade to $50bn by 2015. ANKARA - China and Turkey would establish a strategic cooperative relationship for better economic and political ties, Chinese and Turkish leaders said Friday. Visiting Chinese Premier Wen Jiabao and Turkish Prime Minister Recep Tayyip Erdogan made the announcement at a press conference following their meeting during Wen's visit here. Wen said he and Erdogan reached broad consensus during the talks, noting the decision to set up the strategic cooperative relationship would have an important effect on world peace and development. China and Turkey both faced the threat of the three evil forces of terrorism, separatism and extremism and shared common interests in safeguarding the integrity of territory and sovereignty, Wen said. He said China would continue to deepen mutual political trust and take active measures to promote trade with Turkey, whose influence in regional and international affairs China attached importance to. China would encourage investment by Chinese enterprises in Turkey and facilitate cooperation in various economic fields, such as power projects, bridge construction and the financial sector, Wen said. Erdogan said he had very successful talks with Wen and Turkey and China would take a new step in bilateral relations. "China and Turkey have a long history of friendship. Our relations are now entering a new stage of development," Erdogan told reporters. Turkey wanted closer cooperation with China in international organizations, Erdogan said. In the economic field, the two countries agreed to increase their annual trade volume to $50 billion by 2015 and 100 billion dollars by 2020, Erdogan said. Trade volume between China and Turkey exceeded 10 billion dollars in 2009, according to official statistics. He also said Turkey hoped the two countries could use their own currencies in bilateral trade. China and Turkey signed eight pacts on cooperation in areas that included trade, railway construction, infrastructure, communications and cultural exchanges before the press conference. Erdogan said Turkey planned to build 4,500 to 5,000 km of railways and wanted China's cooperation in those projects. China had agreed to provide financial support for the railway projects when conditions were appropriate, he said. Erdogan said Turkey also intended to build a railway connecting Turkey's largest city, Istanbul, and the Chinese capital, Beijing. There were other multiple fields where Turkey and China could further cooperate, such as energy, air transport, culture and tourism, Erdogan said. Wen said better cultural communication would also serve to improve China-Turkey ties, saying the two ancient civilizations should have more dialogue and exchanges. A cultural event named "Experience China in Turkey" will be held in the Turkish capital, Ankara, and Istanbul after Wen's visit, which Wen said would enhance the Turkish people's understanding of China. Wen arrived here Thursday night after visiting Greece, Belgium and Italy. He will travel to Istanbul later Friday. ANKARA -- China and Turkey signed eight pacts to improve economic and cultural cooperation during Chinese Premier Wen Jiabao's visit here Friday. The agreements, signed by officials from the two countries, covered such areas as trade, transport, infrastructure, communications and cultural exchanges. Wen and Turkish Prime Minister Recep Tayyip Erdogan witnessed the signing ceremony. The two leaders met earlier Friday and discussed bilateral relations and ways to further enhance cooperation between the two countries. Annual trade volume between China and Turkey exceeded US$10 billion in 2009. The two countries have deepened mutual political trust, increased trade volume and expanded cultural exchanges in recent years. Wen arrived here Thursday night after visiting Greece, Belgium and Italy. ANKARA - Chinese ambassador to Turkey Gong Xiaosheng said on Tuesday Chinese Premier Wen Jiabao's upcoming visit to Turkey will boost the two countries' relations to a new level. Wen will pay an official visit to Greece, Belgium, Italy and Turkey from Oct 2 to 9, China's Foreign Ministry spokeswoman Jiang Yu announced in Beijing on Monday. At the invitation of Turkish Prime Minister Recep Tayyip Erdogan, Wen will start his visit to Turkey from Oct 7. He will meet Erdogan and Turkish President Abdullah Gul, said Gong. Wen is expected to discuss with Turkish leaders on bilateral relations as well as the two countries' cooperation in major international issues, he said. The two sides are also likely to sign eight to 10 agreements or documents on economic and cultural cooperation, covering fields of transportation, energy and communications, Gong told reporters. China and Turkey have seen frequent visits of high-level officials in recent years, including Gul's visit to China in June last year. The two countries saw their trade surge from more than $1 billion in 2000 to $12.6 billion in 2008 but drop 19.8 percent year-on-year to $10.08 billion in 2009 because of the global recession, figures from China's Foreign Ministry showed. In 2009, China's exports to Turkey stood at $8.3 billion while imports from Turkey reached only $1.7 billion. China doesn't want a huge trade surplus and has made great efforts to balance the trade ties, said Gong. He noted the Chinese government has encouraged Chinese enterprises to import from and increase investment in Turkey, sent purchasing groups and boosted the number of Chinese tourists in Turkey. "Around 50,000 Chinese tourists visited Turkey in 2008, while the current figure has exceeded 100,000," said Gong. He also urged the Turkish government to carry out more promotional activities in China, increase Chinese people's understanding of Turkey and provide more convenience and preferential policies to encourage Chinese businesses to invest in the country. We expect the Chinese-Turkish ties to have a new and better development and leap forward after Wen visits Turkey," Gong Xiaosheng, China's ambassador to Turkey, told a press briefing in the Turkish capital of Ankara. "As the two nations know more about and work more with each other, I believe there will be a great prospect for our cooperation." ISTANBUL, Oct. 9 2010 (Xinhua) -- Chinese Premier Wen Jiabao's four-nation Eurasian tour has scored marked achievements and further deepened China-Europe cooperation, said Foreign Minister Yang Jiechi, who described the visit as "a great complete success." Turkish press hail Chinese Premier's visit as "milestone"
Turkey's ambassador to China Murat Salim Esenli said in an exclusive interview with China Daily that bilateral trade volume is expected to hit $17 billion this year. Beijing - Turkey plans to multiply its railroad projects with People's Republic of China and welcomes more inbound Chinese investment, the country's ambassador has said. "China is involved in the construction of the high-speed railway system between Ankara and Istanbul," Ambassador Murat Salim Esenli told China Daily in an exclusive interview. "We are planning to multiply these kinds of cooperation areas." The diplomat made the remarks as Premier Wen Jiabao is on his first official visit to the Eurasian republic. The last time a Chinese premier visited the country was in 2002. "We attach tremendous importance to the premier's visit," Esenli said. "Hopefully, it is going to open new venues of cooperation." China and Turkey are building a $1 billion high-speed railway linking Ankara and Istanbul. Enhanced transportation links between China and Turkey will boost bilateral trade volume and efficiency, Esenli said. "Through the Silk Road, our ties had been maintained, and transportation-wise, Turkey is strategically located," the ambassador said. "Through land connections, just like the Silk Road, we will be able to shorten the transportation time from China to Turkey by 50 percent." Transporting goods by sea takes at least 22 days, depending on weather conditions. It takes about 11 days by land, Esenli said. "We are also encouraging Chinese companies to come to Turkey and establish their production lines there," he said. Two Chinese telecommunication enterprises operate in Turkey - Huawei and ZTE. Since establishing their production lines in the country, they have gone beyond meeting local demand to also catering to the needs of the Middle Eastern and African markets, the ambassador added. China is Turkey's biggest Asian trade partner, with a bilateral trade volume worth $10 billion last year. "This year, we hope to bring it up to $17 billion," Esenli said. He also said he hopes there will be more exports of goods from Turkey to China to close the deficit. Turkish President Abdullah Gul visited China for the first time in 2009 - two years after taking office. He paid a six-day state visit and met with his Chinese counterpart, Hu Jintao, in Beijing. Turkey has a powerful economic engine and has grown faster than most EU countries in the first half year of 2010. It has sought full membership in the bloc for decades. BEIJING - China is willing to share with Turkey its expertise in high-speed railway construction and looks forward to more cooperation in the field, a Chinese railway official has said. Chen Juemin, director-general of the international cooperation department of the Ministry of Railways, told China Daily that work on the Ankara-Istanbul high-speed railway project in Turkey, a pioneering model of Sino-Turkish cooperation, has been going smoothly. "China would like to share its expertise in high-speed railway planning, design, construction, operation and management with more partners in the future," he said. The high-speed rail line between Turkey's capital Ankara and the country's largest city, Istanbul, is the biggest project Chinese companies are undertaking as general contractors in Turkey. The high-speed railway is 158 kilometers long and has a designed speed of 250 km per hour. Two Chinese enterprises and their Turkish cooperative partners won the bid for the project, which has a total contract value of about $1.27 billion, in 2006. Wang Xusheng, president of China National Machinery Import & Export Corp, one of the construction's contractors, told China Daily the project is a milestone, as it is "China's first overseas high-speed railway project". "China is bringing its advanced railway equipment and modern technology to its partner," he said. "This will also help upgrade Turkey's logistics industry and expand the country's employment." China's rapid development in the high-speed railway arena is capturing world attention. On Tuesday, a high-speed train between Shanghai and Hangzhou city, Zhejiang province, set a new speed record during its trial run. The China-made CRH380A train hit a top speed of 416.6 km an hour, Xinhua News Agency reported. "China has 7,055 km of high-speed railway in service," He Huawu, the ministry's chief engineer, told Xinhua last month. "It is the world's longest and the fastest, and boasts the most comprehensive technology." BEIJING, Sept. 30 (Xinhua) -- Chinese Premier Wen Jiabao's upcoming visit to Turkey will stimulate China-Turkey ties, Turkish Ambassador to China Murat Salim Esenli said Wednesday. It will be the first time in eight years for a Chinese premier to visit Turkey, so the visit is significant, Esenli told Xinhua in an exclusive interview. Wen will pay official visits to Greece, Belgium, Italy and Turkey from Oct. 2 to 9. At the invitation of his Turkish counterpart, Recep Tayyip Erdogan, Wen will visit Turkey from Oct. 7. During Turkish President Abdullah Gul's visit to China last year, Chinese President Hu Jintao proposed advancing the two nations' friendly bilateral ties and cooperative relationship to a new high. Over history, there had been a considerable interaction between the two peoples, Esenli noted, adding that he feels "optimistic about the future of bilateral ties." Concerning economic ties, he said bilateral trade is developing well, adding that Turkey hopes to receive more Chinese investment. Trade between the two countries surged from 1 billion U.S. dollars in 2000 to 12.6 billion U.S. dollars in 2008. ISTANBUL, Oct. 9 (Xinhua) -- Chinese Premier Wen Jiabao on Saturday highlighted cultural diversity, calling for more people-to-people exchanges, as he continued his three-day visit to Turkey. "Diversity is one of the characteristics of the world culture. We have a bright world just because we have the colorful culture," said Wen while talking with representatives from Chinese and Turkish cultural circles. "China and Turkey are both countries with ancient civilizations, we can learn from each other," Wen said, "I attach great importance to the cultural exchanges between the two countries." Wen said China and Turkey, both enjoying deep-rooted cultures, were now on the fast track of modernization and should make joint efforts to implement measures on cultural exchanges and boost bilateral friendship. Wen also said China and Turkey had decided to add 21 more flights between the two countries to facilitate people-to-people exchanges. Wang Zhaopeng has just returned to Beijing after spending a year as an exchange student in Turkey's Ankara University. Of his many cherished memories the one that is still fresh in his mind is of the Shanghai Cultural Week held there. Wang, whose major is the Turkish language, recalls how the stunning acrobatics and Shaolin martial arts wowed Ankara's audience. "The very next day, my Turkish friends were asking me to teach them kungfu," he says. Despite the Xinjiang Cultural Week of 2006 and Henan Culture Week of 2007, Wang says Turks know little about China. He says he and his classmates were often asked basic questions about the country by other Turkish classmates. Beijing Foreign Studies University (BFSU), one of the nation's most prestigious foreign universities, has 20 students majoring in Turkish, including Wang. The university recruits Turkish major students every four years. Li Zhiyu, one of BFSU's teachers of Turkish says their four-year Turkish-language major program was begun in 1985. The first two years are devoted to picking up basic language skills, with students being put through classes in Turkish history, politics and culture, from the third year. Outstanding students are given the opportunity to study in Turkey for one year. "While the 2003 batch of graduates work mainly for the government, those graduating in 2007 are mostly with trade corporations. 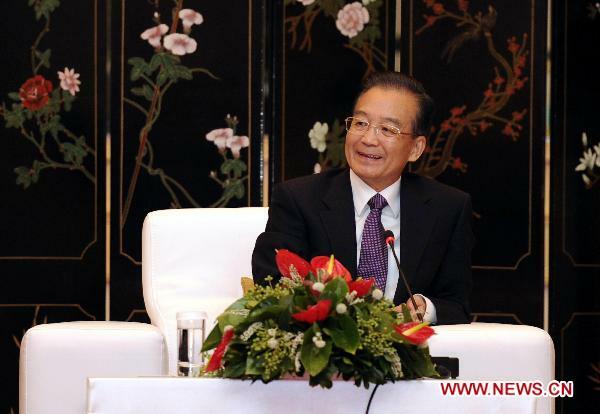 Increasing bilateral trade holds even better prospects for the 2011 graduates," Li says. According to the National Bureau of Statistics of Turkey, in the first seven months of 2010, Turkish exports to China totaled $1.24 billion and imports $9.01 billion, a respective increase of 76 and 36.8 percent over the previous year. According to Li, besides BFSU and the Communication University of China, the Shanghai International Studies University too will soon be offering a major in Turkish. Zhou Jiang, a BFSU graduate, has warm memories of the time she spent in Ankara and particularly of the Turks' friendly and helpful nature. Guan Bo, another graduate, has similar stories. Guan worked as Chinese teacher for a 10-year-old girl named Deniz Imanci, whose father, a lawyer named Ali Imanci, is interested in Chinese antiques. When Guan showed the family pictures of China, they were amazed by how modern it looked. "It was very different from what they thought," Guan says. At his farewell party, Ali's family made traditional Turkish food, and Guan and his classmate Mao Jingsong showed off their Chinese dishes. China and Turkey on Friday issued a joint declaration on the establishment and development of a strategic relationship of cooperation, further upgrading the level of bilateral relations. The two emerging developing countries agreed to maintain the momentum of high-level exchange of visits, deepen political mutual trust, expand bilateral friendly exchanges and formally launch a mechanism of joint working group of the two foreign ministries, the declaration said. Chinese Premier Wen Jiabao was in Turkey for an official visit Thursday through Saturday at the invitation of Prime Minister Recep Tayyip Erdogan. The two sides made an overall review of and highly appraised the development of bilateral relations and expressed satisfaction over the fruitful achievements in the relations. It is the shared view of the two sides that as emerging developing countries, both China and Turkey are at an important stage of development, the declaration said. Wen said China and Turkey have witnessed frequent high-level bilateral exchanges, steady growth of economic, trade and investment cooperation, and good cooperation in regional and international affairs since the establishment of diplomatic ties between the two countries.The establishment of a strategic relationship of cooperation, which the two sides agreed upon Friday, is in the fundamental interests of the two countries and the peoples and is beneficial to world peace and development, he said. Wen said China is willing to work together with Turkey on the implementation of the important consensus and agreements that the two sides have reached to turn a new chapter in bilateral relations. Gul said Wen's successful visit to Turkey is sure to bring bilateral relations to a new level. He reiterated Turkey's adherence to the one-China policy. The Turkish president said that he saw great potential in the bilateral economic and trade cooperation and that Chinese enterprises are welcome to be involved in Turkish economic development. Gul said mutual understanding between the two peoples is very important and he hoped that the two countries will celebrate the 40th anniversary of the establishment of diplomatic ties next year with further expansion of bilateral cultural exchanges and tourism cooperation. Wen arrived in Turkey Thursday on a three-day official visit at the invitation of Prime Minister Recep Tayyip Erdogan. The Chinese premier's visit comes weeks after the two countries' air forces for the first time held joint maneuvers in Central Anatolia. The Turkish press reported that a Turkish defense official confirmed that Turkey's U.S.-made F-4 fighter aircraft and China's Russian-made fighters took part in exercises in September 2010. According to the Turkish Daily News, the Israeli newspaper Haaretz had reported the United States and Israel were concerned about growing military cooperation between China and Turkey. In addition to financial and energy disputes, and China's close ties with Iran, which is accused by the West of seeking to obtain nuclear weapons, the United States is worried about Beijing's efforts to bolster its military, and particularly, naval capabilities, the newspaper reported. China is also willing to enter the Turkish defense market, seeking to win a multibillion-dollar contract for Turkey's program for buying a national missile defense system to protect strategic areas and installations from potential ground-to-ground ballistic missile strikes. Competing in the ongoing Turkish contest are U.S. Lockheed Martin and Raytheon, with their Patriot Advanced Capability-3 systems; Russia's Rosoboronexport, marketing the S300; China's Precision Machinery Export-Import Corp., or CPMIEC, offering its HQ-9; and the Italian-French Eurosam, maker of the Aster 30. ISTANBUL, Oct. 9 (Xinhua) -- Chinese Premier Wen Jiabao assured Turkish businessmen Saturday that China was committed to developing closer trade and investment ties with Turkey, promising to increase bilateral trade to 50 billion U.S. dollars in five years. "We've set an ambitious goal of 50 billion dollars trade volume between China and Turkey in five years," Wen told a group of Turkish businessmen in Istanbul, adding the goal is reachable but needed arduous efforts. The trade volume between China and Turkey in 2009 stood at 10 billion dollars, with a surplus in favor of China. To achieve balanced trade with Turkey, Wen promised the Turkish businessmen China would send more trade commissions to Turkey to import more Turkish products. "China never pursues a trade surplus but a balanced and sustainable trade," Wen said. Wen said that the two countries can sign a currency swap agreement to facilitate financing cooperation and establish banking branches in each other's countries. "China's related financing departments will buy Turkey's bonds to help Turkey stabilize its financial market," Wen said. He stressed that both sides should address each other's concerns and carry out close exchanges, consultations and stand against trade protectionism. 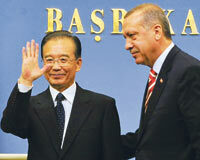 "I think China-Turkey trade cooperation is just unfolding and will enjoy great prospects," Wen added. Wen arrived in the Turkish capital city of Ankara Thursday night after visiting Greece, Belgium and Italy. During his two-day visit, Wen held talks with his Turkish counterpart Recep Tayyip Erdogan and attended the signing ceremony of eight agreements between the two countries in sectors such as trade, transport, infrastructure, communications and cultural exchanges. Premier Wen will hold talks with Prime Minister Recep Tayyip Erdogan, and meet Turkish President Abdullah Gul, during his visit to Turkey in October 2010. The Chinese Premier will also meet with business circles and hold seminars with people from cultural circles. "China-Turkey relations have witnessed smooth development, and the two countries cooperate fruitfully in many areas. Cooperation in such areas as investment, transportation and energy are progressing steadily. The two countries also carry out frequent exchange between governments, parliaments, local governments and non-governmental organizations," Zhai said. According to Zhai, China and Turkey are two important developing countries, which share a broad common interest in maintaining world peace and promoting common development. China hopes Wen's visit will help the two countries map out a blueprint for the future development of bilateral relations. The two sides are expected to sign several agreements on economic and cultural cooperation. Xinhua Sept. 29, 2010 - Chinese ambassador to Turkey Gong Xiaosheng said Tuesday Chinese Premier Wen Jiabao's upcoming visit to Turkey in October will boost the two countries' relations to a new level. We expect Chinese-Turkish ties to have a new and better development and leap forward after Wen visits Turkey," Gong told a press briefing in the Turkish capital of Ankara. "As the two nations know more about and work more with each other, I believe there will be a great prospect for our cooperation." Wen will pay an official visit to Turkey in October, China's Foreign Ministry spokeswoman Jiang Yu announced in Beijing. Wen is expected to discuss bilateral relations with Turkish leaders, as well as the two countries' cooperation in major international issues, he said. The two sides are also likely to sign 8 to 10 agreements or documents on economic and cultural cooperation, covering the fields of transportation, energy and communications, Gong told reporters. China and Turkey have seen frequent visits of high-level officials in recent years, including Gul's visit to China in June last year. The two countries saw their trade surge from more than one billion U.S. dollars in 2000 to 12.6 billion U.S. dollars in 2008 (but saw a drop in 2009 due to the global recession). In 2009, China's exports to Turkey stood at 8.3 billion U.S. dollars while imports from Turkey reached only 1.7 billion U.S. dollars. China doesn't want a huge trade surplus and has made great efforts to balance the trade ties, said Gong. He noted the Chinese government has encouraged Chinese enterprises to import from and increase investment in Turkey, sent purchasing groups and boosted the number of Chinese tourists in Turkey. "Around 50,000 Chinese tourists visited Turkey in 2008, while the current figure has exceeded 100,000," said Gong. He also urged the Turkish government to carry out more promotional activities in China, increase Chinese people's understanding of Turkey, and provide more convenience and preferential policies to encourage Chinese businesses to invest in the country. China and Turkey established diplomatic relations on August 4, 1971. Since the establishment of diplomatic relations, Sino-Turkish relations have been developing smoothly. Especially, since 1980s, the exchanges between the two countries have been increased and the relations have developed rapidly. Turkish leaders who visited China are President Evren (December 1982), Prime Minister Ozal (July 1985), Speaker of the Grand National Assembly Karaduman (October 1985), President Demirel (May 1995) and Speaker of the Grand National Assembly Mustafa Kalemli (August 1996). Chinese leaders who visited Turkey are President Li Xiannian (March, 1984), Premier Zhao Ziyang (July, 1986), Chairman of the Eighth Standing Committee of National People's Congress Qiao Shi (November, 1996) and Chairman of the Ninth Standing Committee of National People's Congress Li Peng (April, 1999), In April 2002, Premier Zhu Rongji of the State Council of China visited Turkey. 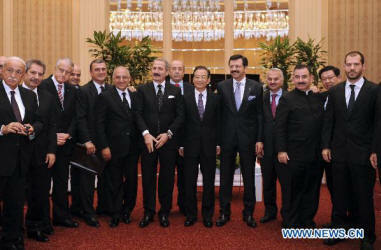 Chinese Prime Minister Wen Jiabao visited Turkey with a high level business delegation in October 2010. ANKARA (23 Ekim 2010) - Başbakan Recep Tayyip Erdoğan ile Çin Halk Cumhuriyeti Başbakanı Wen Jiabao'nun bu ayın ilk yarısında Türkiye'ye yaptığı ziyaret sırasında varılan mutabakat ve anlaşmaların hayata geçirilmesi için önemli bir adım atılıyor. Dışişleri Bakanı Ahmet Davutoğlu 27 Ekim ile 2 Kasım tarihleri arasında Çin'i ziyaret edecek. Ahmet Davutoğlu, 27 Ekim ile 2 Kasım günleri arasında Çin'e yapacağı ziyaret, iki ülke başbakanların arasındaki görüşmelerde varılan mutabakatlar ve imzalanan anlaşmaların hayata geçirilmesi için önem taşıdığı belirtiliyor. Başbakan Erdoğan, 8 Ekim'de Ankara'da düzenlenen ortak basın toplantısında ay sonunda Davutoğlu'nun Çin' e gideceğini açıklamıştı. Dışişleri Bakanı Ahmet Davutoğlu'nun, 27 Ekim-2 Kasım tarihlerinde Çin Halk Cumhuriyeti'ne kapsamlı ziyaret programında Sincan Uygur Özerk Bölgesi de yer alıyor. Çin Dışişleri Bakanı Yang Jiechi'nın resmi davetlisi olarak Çin'e gelecek olan Davutoğlu'nun ziyareti Sincan Uygur Özerk Bölgesi'nden başlıyor. Burada yerel yetkililerle görüşecek olan Bakan, tarihi Şian (Xian) şehrine geçecek. Geçtiğimiz temmuz ayında şiddet olaylarının yaşandığı Urumçi'yi ziyaret ederek, Kaşgar kentine uğrayacak olan Bakan, ilk Türkçe sözlük olarak kabul edilen Divanü Lügati't-Türk'ün yazarı Kaşgarlı Mahmud'un türbesini ziyaret edecek. Davutoğlu bölgeyi ziyaret eden ilk Türk dışişleri bakanı olacak. Davutoğlu, 2010 Şanghay Expo'nun kapanış törenine katılıp, Çin Başbakanı Wen Jiabao'un konuşma yapacağı Expo Zirve Forumu'na katılacak. 1 Kasım Pazartesi Pekin'e geçecek olan Davutoğlu, burada mevkidaşı Yang ile görüşecek. Burada, Çin Uluslararası Araştırmalar Enstitüsü yuvarlak masa toplantısına katılacak Davutoğlu, Pekin'deki Renmin Üniversitesi'nde de Çinli öğrencilere Türk-Çin ilişkileri ve Türk dış politikası konusunda hitap edecek. Pekin'deki Türklerle de bir araya gelecek olan Davutoğlu, Çin televizyonuna mülakat verecek. Çin'i en son dışişleri bakanı olarak, 2005 yılındaAbdullah Gülziyaret etmişti. Kars-Tiflis-Bakü hattıyla ilgili atılan adımları da hatırlatan Başbakan Erdoğan, Marmaray`ın bitmesinden modern İpekyolu`nun kurulabileceğini ifade etti. Çin Başbakanı Ven Ciabao da, stratejik ortaklığın iki ülke ilişkileri açısından kilometre taşı olacağını kaydetti. Tarihi İpek Yolu'nun dün olduğu gibi bugün de önemini koruduğunu anlatan Başbakan Erdoğan, Pekin ile Londra arasında Türkiye'nin tam merkezde yer aldığını kaydederek, gerekli altyapıyı tesis ederek Türkiye'nin bu imkanını azami derecede kullanılmasının ve Türk Milletinin ve Türkiye'nin hizmetine sunulmasının şart olduğunu söyledi. Demiryolu taşımacılığında da çok farklı adımlar atıldığına ifade eden Erdoğan, 2013'te Marmaray'ın tamamlanacağını söyledi. Erdoğan, "Marmaray'ın bitişi ile Londra'yı Pekin'e bağlıyoruz. Sadece TIR'larla lastikli sistemle değil, şimdi demiryolu ağı ile de bağlıyoruz. Boğaz'ı denizin altından geçmek suretiyle bu da halloluyor. Bunu raylı sistem ile mümkün hale getirmemiz hem Marmaray ile hem Bakü-Tiflis-Kars Demiryolu ile Londra-Pekin arasındaki demiryolu ulaşımını kesintisiz hale getiriyoruz. Şu anda bir taraftan Kars-Tiflis-Bakü, bunun çalışmaları devam ediyor. Bir taraftan da Marmaray, o da devam ediyor" diye konuştu. Erdoğan, Türkiye'nin deniz taşımacılığında da farklı bir boyuta geçtiğini bildirerek, denizlerini yeniden keşfeden Türkiye'nin gemi inşa sanayinde olduğu kadar, deniz taşımacılığında da dünya ile rekabete başladığını vurguladı. Hava taşımacılığında süratle, gelişen bir yapıya, bir güce ulaşıldığını dile getiren Erdoğan, THY'nin 2002 sonunda 103 olan uçuş noktası sayısının bug ün 163' yükseldiğini söyledi. THY'nin şu anda dünyada ilk yedinin arasında yer aldığını hatırlatan Erdoğan, THY'nin hava insan taşımacılığı ile birlikte kargo taşımacılığında da yerini aldığına söyledi. Erdoğan, şöyle konuştu: "Ekonomide, ticarette, dış politikada bu istikrarlı büyümeye devam edeceğiz. Bunda kararlıyız ve Türkiye'yi muasır medeniyetler seviyesinin üstüne kesinlikle çıkarıyoruz, çıkaracağız. Türkiye, artık lafta stratejik konumda olan ülke değil. Uygulamada stratejik bir konumda olduğunu ispat ettiği kadar, lojistik önemini de işte şu yatırımlar ile ortaya koyan bir ülke. Bu istikrarlı büyümenin gerektirdiği altyapı çalışmalarını da aynı kararlı lıkta devam ettiriyoruz." Çin ile uluslararası kuruluşlarda örnek bir işbirliği içinde olduklarını belirten Erdoğan, sözlerini şöyle sürdürdü: "Turizmde atabileceğimiz müşterek adımları değerlendirdik. Havayolu ulaşımını artıralım istiyoruz. Kars-Tiflis-Bakü demiryolu ağımız var. Biz İstanbul'u Pekin'e bağlayacak adım atmak istiyoruz Marmaray projesi 2013'te bitiyor. Marmaray'ın bitişiyle birlikte ve Edirne- Kars bu aradaki belli bir bölümü bitmiş hızlı tren hattının tamamlanması suretiyle, modern İpek Yolu'nu yeniden tesis etme imkanına kavuşmuş olacağız. Bununla ilgili de ulaştırma bakanlarına gerekli talimatları vermiş bulunuyoruz." "ÇİN TARAFI TİCARETİN DENGELİ GELİŞMESİ İÇİN ÇALIŞMASI YAPACAK"
Jiabao ise basın toplantısında iki ülke arasında stratejik ortaklık ilişkisi kurulmasına karar verildiğini açıklayarak, "Bu önemli bir kilometre taşı olacaktır, halklarımız arasındaki dostluğa ve dünya barışına olumlu etkiler yapacaktır" dedi. "Çin tarafı ticaretin sürdürülebilir ve fazla açık olmadan dengeli bir şekilde gelişmesi için çalışma yapacaktır" diyen Jiabao, "Çin tarafı demiryolu, köprü ve enerji alanında Türk tarafı ile yoğun işbirliği yapacaktır.Türkiye ile ticari ilişkileri geliştirmek istiyoruz" dedi. Türkiye ve Çin arasında halklar arası dostluğun artırılmasının önemli olduğunu belirten Jiabao, karşılıklı olarak "kültürel yıllar" ilan etme kararı aldıklarını, böylece halkların birbirini daha iyi tanımasının mümkün olacağını belirtti. Çin Başbakanı Wen'in Ankara ziyaretinde iki ülke 8 anlaşmayla stratejik işbirliğinin temellerini attı. G20’nin iki üyesi Çin ve Türkiye, Wen’in Ankara ziyaretinde ikili ticaret hacmini beş yılda 17 milyar dolardan 50 milyar dolara çıkarmayı amaçlayan sekiz anlaşmaya imza atarak yeni bir sayfa açtı. Başbakan Tayyip Erdoğan’a konuk olan Wen, ziyarete yükledikleri anlamı “İkili ilşikileri stratejik ortaklığa dönüştürmeye karar verdik” diye aktardı. Dışişleri Bakanı Ahmet Davutoğlu’nun ekimde Çin’e gideceğini anlatan Erdoğan, iki ülke arasındaki 17 milyar dolarlık ticaret hacmini 2015’e kadar 50, 2020’ye kadar ise 100 milyar dolara çıkarmayı hedeflediklerini söyledi. Erdoğan, “Bu bağlamda ilişkilerimizi stratejik işbirliği seviyesine yükseltme konusunda da arzumuz var. Bu rakamlara ulaşırken bir adım daha atalım. Bütün ilişkilerimizi Türk Lirası ve Yuan bazında yürütelim. Bu konuda da mutabık kaldık. Bu da öyle zannediyorum ki Rusya ve İran’dan sonra en önemli adım olacak” dedi. Görüşmelerde, THY’nin Çin’e düzenlediği seferlerin arttırılması kararlaştırıldı. Kars-Tiflis-Bakü hattıyla İstanbul’u Pekin’e bağlayacak adımı atmak istediklerini söyleyen Erdoğan, Marmaray’ın tamamlanmasıyla Modern İpekyolu’nun yeniden kurulacağını söyledi. Çin Başbakanı Wen Jiabao ve Türkiye Başbakanı Recep Tayyip Erdoğan, iki ülke arasındaki ilişkilerin stratejik işbirliği düzeyine çıkarıldığını ilan etti. Resmi bir ziyaret için Türkiye'de bulunan Çin Başbakanı Wen, bugün (8 Ekim) Ankara'da Türkiye Başbakanı Erdoğan'la görüştü. Wen Jiabao görüşmeden sonra düzenlenen ortak basın toplantısında, Çin ile Türkiye arasında stratejik işbirliği ilişkilerinin başlatılmasının, ikili ilişkilerin gelişme sürecinde önemli bir kilometretaşı oluşturarak iki ülke halklarına somut kazanç sağlayacağını, aynı zamanda dünya barışı ve gelişmesine de hizmet edeceğini belirtti. Wen, bu ilişkiler çerçevesinde iki ülke arasında başta üst düzey temaslar olmak üzere bütün kademelerdeki istişarelerin yoğunlaştırılacağını, siyasi alandaki karşılıklı güvenin arttırılacağını ve stratejik işbirliğinin gerçekleştirileceğini söyledi. Her iki ülkenin "Üç Kötü Güç" olarak nitelenen terörizm, bölücülük ve aşırı uçların tehdidiyle karşı karşıya bulunduğuna dikkat çeken Çin Başbakanı Wen, dolayısıyla Çin ile Türkiye'nin egemenliği, toprak bütünlüğünü ve ulusal güvenliği ilgilendiren önemli konularda birbirlerine kararlı destek vererek eşgüdümü yoğunlaştıracaklarını vurguladı. Recep Tayyip Erdoğan da Türkiye-Çin ilişkilerinin stratejik işbirliği düzeyine çıkarılmasını ikili ilişkilerde atılan yeni bir adım olarak niteledi. İki ülke arasındaki siyasi istişarelerin yoğunlaştırılacağını, ekonomik ve ticari işbirliğinin yeni bir boyut kazanacağını kaydeden Erdoğan, aynı zamanda uluslararası örgütlerdeki eşgüdümü ve işbirliğini pekiştireceklerini, böylece ikili ilişkileri daha ileriye taşıyacaklarını belirtti. Erdoğan konuşmasında ayrıca, iki ülke arasında bugün 17 milyar dolar olan ticaret hacminin 2015 yılına kadar 50 milyar dolara çıkarılmasının kararlaştırıldığını da duyurdu. Çin Başbakanı'nın resmi Türkiye ziyareti kapsamında, iki ülke arasında ekonomi ve ticaret, üçüncü ülkelerde altyapı inşası ve teknoloji danışmanlığı, kültürel değişim, bilişim, haberleşme, deniz taşımacılığı ve demiryolları alanlarında sekiz ayrı işbirliği anlaşması imzalandı. Türkiye, Çin Başbakan Wen Jiabao'nun Avrupa ve Asya'daki dört ülkeyi kapsayan gezisinin son durağı. Çin Başbakanı Türkiye'den önce Yunanistan, Belçika ve İtalya'yı ziyaret etmiş ve Brüksel'de düzenlenen 8. Asya-Avrupa Zirvesi ile 13. Çin-Avrupa Zirvesi'ne katılmıştı. Çin Başbakanı Wen Jiabao, Türkiye Başbakanı Recep Tayyip Erdoğan'ın daveti üzerine dün (7 Ekim) özel uçakla Roma'dan Ankara'ya geçti ve bugün Türkiye'deki resmi ziyaretine başladı. Wen Jiabao'nun Türkiye'ye gelişi, sekiz yıl aradan sonra Çin Halk Cumhuriyeti'nden Türkiye'ye başbakan düzeyinde bir resmi ziyaretin gerçekleştirilmesi nedeniyle de ayrı bir önem taşıyor. Wen Jiabao ziyareti sırasında Türkiye Cumhuriyeti Başbakanı'yla Çin-Türkiye ilişkilerinin geliştirilmesi, üst düzey temasların güçlendirilmesi, ticaret, ekonomi, finans, enerji, ulaşım ve kültür gibi birçok alanda işbirliğinin ilerletilmesi gibi konuları ele alacak. Başbakan Wen'in bugün (8 Ekim) Türkiye'nin en büyük kenti İstanbul'a geçerek Türkiye Cumhurbaşkanı Abdullah Gül ile de görüşmesi ve Türkiye'deki sanayi, ticaret ve kültür çevrelerinden gelen temsilcilerle görüş alışverişinde bulunması bekleniyor. Türkiye, Çin Başbakan Wen Jiabao'nun Avrupa ve Asya'daki dört ülkeyi kapsayan gezisinin son durağı. Çin Başbakanı Türkiye'den önce Yunanistan, Belçika ve İtalya'yı ziyaret etmiş ve Brüksel'de düzenlenen 8. Asya-Avrupa Zirvesi ile 13. Çin-Avrupa Zirvesi'ne katılmıştı. Başbakan Recep Tayyip Erdoğan, Çin Halk Cumhuriyeti Başbakanı Ven Ciabao ile düzenlediği ortak basın toplantısında, Türkiye ile Çin arasındaki ticaretin Türk Lirası ve Yuan ile yapılacağını açıkladı. İki ülke arasında halen 17 milyar dolar olan ticaret hacminin, yapılan yeni anlaşmalarla 2015’te 50 milyar dolara, 2020’de de 100 milyar dolara ulaşması hedefleniyor. Çin Halk Cumhuriyeti Başbakanı Ven Ciabao, “Çin ve Türkiye arasında stratejik ortaklık ilişkisi kurulmasına karar verdiklerini, bunun iki ülke ilişkileri açısından önemli kilometre taşı olacağını” söyledi. Ven, Başbakan Recep Tayyip Erdoğan ile baş başa ve heyetlerarası görüşmelerin ardından önemli gelişmeler elde ettiklerini kaydetti. Başbakan Erdoğan’ı, uygun bir zamanda karşılıklı güven artırıcı ve stratejik bağlamda ilişkiler kurmak için Çin’e davet ettiğini de bildiren Ven, “İki ülke terörizmle ve aşırıcılıkla mücadelede karşılıklı mekanizmalar kurarak, bu konularda ortak çalışma yapma kararı almıştır” dedi. Çin tarafı iki ülke arasındaki ticaretin “sürdürülebilir ve dengeli” bir şekilde geliştirilmesi için çalışmalar yapacaklarını söyleyen Ven, ülkesinin demiryolu, köprü ve enerji konularında Türk tarafı ile yoğun işbirliği yapacağını belirtti. Türkiye’nin bölgesinde ve uluslararası camiadaki etkinliğini ve gücünü teslim ettiklerini kaydeden Ciabao, Türkiye’nin İran konusunda yaptığı çalışmaları da takdirle karşıladıklarını söyledi. 2009 yılında Türkiye’nin Çin Halk Cumhuriyeti’ne ihracatı 1 milyar 599 milyon dolar olarak gerçekleşti. Bu ülkeden ithalatımız ise 12 milyar 655 milyon dolar oldu. 2009 yılında dış ticaret hacmimiz 14 milyar 254 milyon dolar düzeyinde gerçekleşti. 2010 yılının ilk 8 ayında ise Türkiye’nin Çin’e ihracatı, geçen yılın aynı dönemine oranla yüzde 62.8 artarak 1 milyar 451 milyon dolara ulaştı. Anılan dönemde ithalatımız ise yüzde 37.9 artışla 10 milyar 670 milyon dolar oldu. 2010 yılında ilk 8 aylık döneminde Türkiye ile Çin arasındaki ticaret hacmi ise 12 milyar 121 milyona ulaştı. DIŞ Ekonomik İlişkiler Konseyi (DEİK) Türk-Çin İş Konseyi Başkanı Hüsnü Özyeğin, Türkiye ile Çin arasındaki ticaret hacminin artmasının her iki ülke ekonomisine katkı sağladığını söyledi. Türkiye’nin Çin’den yaklaşık 12 milyar dolarlık ithalatında tüketim mallarının sadece dörtte bir oranında yer tuttuğuna dikkat çeken Özyeğin, “Çin’den toplam ithalatımızın yüzde 11’i tekstil ürünleri, yüzde 15’i de tüketim ürünleri. Geri kalanın büyük bir kısmı Türkiye’nin ihracatının artmasını sağlayacak yatırım malları ve ara mallar. Bu nedenle Türkiye ile Çin arasındaki ticaretin artması Türkiye ekonomisine katkı sağlıyor” diye konuştu. Özyeğin, Çin yatırımları konusunda kamunun yanında özel sektörün de muhatap alınması gerektiğinin altını çizdi. Çin’in, Uluslararası Para Fonu (IMF) 2010 yılı Dünya Ekonomik Görünüm raporu verilerine göre, 2010 ve 2011’de yüzde 10’un üzerinde büyümesi bekleniyor. ABD’den sonra dünyanın ikinci büyük ekonomisi olan Japonya’yı 2011’de yerinden etmesi beklenen Çin’in, 2010 yılında Gayri Safi Yurtiçi Hasılası (GSYH) 5.7 trilyon dolar olacak. 14.6 trilyon dolar ile ABD dünyanın en büyük ekonomisi olurken, Japonyanın 2011’de 5.4 trilyon dolar ile üçüncü sırada yer alması bekleniyor. IMF verilerine göre Çin, 2011’de 6.7 trilyon dolar GSYH elde edecek. Bu rakam 2015’te 10 trilyon dolara çıkacak. Hükümetlerarası İkili Ticari ve Ekonomik İşbirliğinin Geliştirilmesi ve Derinleştirilmesine İlişkin Anlaşma. İkili Ticari ve Ekonomik İşbirliğine İlişkin Orta ve Uzun Dönem Gelişim Planı İçin Ortak Çalışma Başlatılmasına İlişkin Mutabakat Muhtırası. Üçüncü Ülkelerde Altyapı İnşası ve Teknik Danışmanlık Hizmetlerinde İşbirliğini Artırmaya İlişkin Mutabakat Muhtırası. Dış Ticaret Müsteşarlığı ile Çin Ticaret Bakanlığı Arasında Yeni İpek Yolu Bağlantısı Hakkında Ortak Çalışma Grubu Oluşturulmasına İlişkin Mutabakat Muhtırası. Ulaştırma Bakanlığı ile Çin Sanayi ve Bilgi Teknolojisi Bakanlığı Arasında Bilgi ve İletişim Teknolojileri Alanlarında İşbirliğine İlişkin Mutabakat Muhtırası. iki ülke ulaştırma bakanlıkları arasında Ulaştırma Altyapısı ve Denizcilik Alanlarında İşbirliğine İlişkin Mutabakat Muhtırası. Başbakan Erdoğan toplantıda yaptığı açıklamada, iki ülke arasındaki ticaretin Türk Lirası ve Yuan üzerinden yapılmasına karar verdiklerini söyledi. Başbakan Recep Tayyip Erdoğan, “Çin Halk Cumhuriyeti ile ikili dış ticaret hacmine baktığımızda, 17 milyar dolar gibi bir dış ticaret hacmine sahibiz. Bugün aramızda bir takvim belirledik, bu takvime göre, 2015 yılına kadar, bu ticaret hacmini 50 milyar dolara çıkaralım dedik ve ikinci bir etabı da 2020 yılına kadar koyduk, 2020 yılında da bu ticaret hacmini 100 milyar dolara ulaştıralım dedik” diye konuştu. Çin Halk Cumhuriyeti Başbakanı Wen Jiabo'nun Türkiye'ye gerçekleştirdiği resmi ziyaret çerçevesinde, iki ülke arasında ticaret, kültür ve ulaştırma konularında 8 anlaşma imzalandı. Söz konusu anlaşmalar, Başbakan Recep Tayyip Erdoğan ile Çin Halk Cumhuriyeti Başbakanı Wen Jeabo'nun Başbakan Merkez Binada ortaklaşa gerçekleştirdiği basın açıklaması öncesinde imzalandı. Rusya Devlet Başkanı Dmitriy Medvedev ile Kremlin Sarayı’nda bir araya gelen Cumhurbaşkanı Abdullah Gül, 2009 yılı Şubat ayındaRusya ile ticarette iki ülke arasında TL-Ruble döneminin başladığını duyurmuştu. Başbakan Recep Tayyip Erdoğan, 2009 yılının Ekim ayındaki Tahran ziyareti sırasında, İran’la ticarette de Euro ya da Amerikan doları gibi döviz kurları devre dışı bırakılacağını açıklamıştı. Erdoğan ülkelerarası ticaretin, Türk Lirası ve İran Riyali üzerinden yapılacağını belirtmişti. Özyeğin, Çin'in dünya ekonomisindeki yerine bir bankacı ile baktığı zaman batılıların çifte standart uyguladığını, Çin'in ekonomik başarılarını batının kıskandığını savundu. Dış Ekonomik İlişkiler Konseyi (DEİK) bünyesindeki Türk-Çin İş Konseyi Başkanı Hüsnü Özyeğin, Çin'in dünya ekonomisindeki yerine bir bankacı ile baktığı zaman batılıların çifte standart uyguladığını, Çin'in ekonomik başarılarını batının kıskandığını savundu. Özyeğin, Çin heyetinin Türkiye ziyaretine ilişkin yaptığı açıklamada, Türkiye ile Çin arasındaki ticaret hacminin artmasının her iki ülke ekonomisine katkı sağladığını, Türkiye'nin Çin'den yaklaşık 12 milyar dolarlık ithalatında tüketim mallarının sadece dörtte bir oranında yer tuttuğunu belirtti. Çin'den toplam ithalatın yüzde 11'inin tekstil ürünleri, yüzde 15'inin de tüketim ürünlerinden oluştuğuna işaret eden Özyeğin, geri kalan büyük kısmının Türkiye'nin ihracatının artmasını sağlayacak yatırım malları ve ara mallar olduğunu, bu nedenle Türkiye ile Çin arasındaki ticaretin artmasının Türkiye ekonomisine katkı sağladığını vurguladı. Çinli yatırımcıların Türkiye'de yatırım yapabileceği sektörlerin enerji, otomotiv, madencilik, lojistik, elektronik ve bilgisayar olduğunun altını çizen Özyeğin, Türkiye'deki Çin yatırımları konusunda kamunun yanında özel sektörün de muhatap alınması gerektiğini belirtti. Çin'in dünya ekonomisindeki yerine bir bankacı ile baktığı zaman batılıların çifte standart uyguladığını gördüğünü savunan Özyeğin, ''Çin'in ekonomik başarılarını batı kıskanmaktadır. Renminbi'nin değer kazanmasını istemektedirler. Niye batılılar rublenin değer kazanması gerektiğinden bahsetmiyorlar. Halbuki Rusya'nın döviz rezervleri 475 milyar dolar, kişi başına 3.400 dolar. Çin'in rezervleri ise 2,6 milyar dolar, yani kişi başına 1.870 dolar'' değerlendirmesi yaptı. Bu arada, Çin Başbakanı Wen Jiabao'nun İstanbul temasları çerçevesinde yarın Türk işadamları ile biraraya geleceği, Devlet Bakanı Zafer Çağlayan ile Türkiye Odalar ve Borsalar Birliği (TOBB) Başkanı Rifat Hisarcıklıoğlu'nun da aralarında bulunduğu heyetin Çin Başbakanı Jiabao ile karşılıklı görüş alışverişinde bulunacağı bildirildi. Çin Başbakanı Ven Ciabao, İstanbul’da işadamlarına, “İşbirliğini artırmak için Çin’de ve Türkiye’de birlikte organize sanayi bölgeleri kuralım” çağrısı yaptı. Ciabao, Türk tahvillerine yatırım mesajı verdi. Devlet Bakanı Çağlayan, Çin’in Türk tahviline yatırımın 5 milyar dolar olabileceğini söyledi. İSTANBUL’da dün işadamlarıyla biraraya gelen Çin Halk Cumhuriyeti Başbakanı Ven Ciabao, Türkiye’de özel desteklenecek bir “Çin Sanayi Bölgesi” kurmak istediklerini söyledi. Ciabao, Türk-Çin İş Konseyi Başkanı Hüsnü Özyeğin’in, “Türk tahvilleri iyi getiri sağlıyor, dünyada Türk tahviline yatırımı tercih edenler artıyor. Siz de alın” önerisi üzerine, böyle bir yatırıma sıcak baktıkları mesajını verdi. Devlet Bakanı Zafer Çağlayan da, Çin’in Türk tahvillerine yapacağı yatırımın 5 milyar dolar olabileceğini vurguladı. Çin Başbakanı Ciabao, Türkiye Odalar ve Borsalar Birliği (TOBB) Başkanı Rifat Hisarcıklıoğlu ve Türkiye-Çin İş Konseyi Başkanı Hüsnü Özyeğin’in konuşmaların ardından Başbakan Tayyip Erdoğan’ın açıkladığı “2020 yılında iki ülke ticaretinin 100 milyar dolara çıkarılması” vizyonu ile ilgili Türk iş dünyasının görüş ve önerilerini dinlemeyi tercih etti. Hüsnü Özyeğin’in, “Türk tahvilleri iyi getiri sağlıyor, dünyada yatırımcılar Türk tahviline yatırımı tercih ediyor, siz de Türk tahvilini daha fazla tercih edebilirsiniz” önerisi Ciabao’nun dikkatini çekti. Ciabao, “Bu konuya sıcak bakabiliriz. Çin Merkez Bankası’nda bu konu görüşülüyor. Çin Merkez Bankası Türk tahvili alabilir” yanıtı verdi. Ciabao ayrıca, Türkiye’de çeşitli teşviklerin sunulduğu bir “Çin Organize Sanayi Bölgesi” kurulmasının Çin’den yatırım gelmesi açısından etkili olabileceğini vurguladı. Ciabao, “Aynı şekilde Çin’de de Türk şirketleri için özel olarak hazırlanmış Türk Organize Sanayi Bölgesi kurulmasına sıcak bakabiliriz. İstanbul’da yada başka bir yerde olabilir. Örneğin Türk tarafınının Sincan’daki sanayi bölgesi çalışmalarından memnuniyet duyuyoruz” dedi. Rifat Hisarcıklıoğlu (TOBB Başkanı), Rona Yırcalı (DEİK Başkanı), Hüsnü Özyeğin (Fiba Grubu Başkanı-Türk-Çin İş Konseyi Başkanı), Arzuhan Doğan Yalçındağ (Doğan Holding Başkanı), Ali Kibar (Kibar Holding Başkanı), Tuncay Özilhan (Anadolu Grubu Başkanı), Ahmet Çalık (Çalık Grubu Başkanı), Turgay Durak (Koç Holding CEO’su), Zafer Kurtul (Sabancı CEO’su), Temel Kotil (THY Genel Müdürü). ÇİN Başbakanı Ven Ciabao, Türkiye’nin potansiyeline dikkat çekerek, “İki ülke potansiyelini birlikte yeni pazarlara doğru genişletirse, ticaret hacmimizi büyütebiliriz. Türkiye ile Çin büyük bir işbirliği potansiyeli var. Türk işadamlarının Çin’de yatırım yapmaları sürecinde hükümet olarak, hukuk tarafında sizi destekleyecek ve sizi koruyacağız” diye konuştu. BU yıl 17. kez düzenlenecek Van Asya İpekyolu Turizm, Ticaret ve Sanayi Fuarı’nın tanıtımı için tarihi İpekyolu’nu takip ederek Van’a ulaşacak 5 develik kervan, İstanbul’dan yola çıktı. Kervan, Kocaeli, Ankara, Muş ve Bitlis’e de uğrayacak. Van Valisi Münir Karaloğlu, Van Ticaret ve Sanayi Odası (VATSO) Başkanı Zahir Kandaşoğlu, Van Belediye Başkan Yardımcısı Mehmet Selim Bozyiğit’in de aralarında bulunduğu grup, 20-24 Ekim tarihlerinde “Medeniyetin beşiği ticaretin başkenti oluyor” sloganıyla düzenlenecek 17. Van Asya İpekyolu Turizm, Ticaret ve Sanayi Fuarı’nın tanıtım programını İstanbul’dan başlattı. kaydetti. Çin Halk Cumhuriyeti Başbakanı Ven Ciabao, “Çin ve Türkiye arasında stratejik ortaklık ilişkisi kurulmasına karar verdiklerini, bunun iki ülke ilişkileri açısından önemli kilometre taşı olacağını” söyledi. Ven, Başbakan Recep Tayyip Erdoğan ile baş başa ve heyetlerarası görüşmelerin ardından önemli gelişmeler elde ettiklerini kaydetti. Başbakan Erdoğan’ı, uygun bir zamanda karşılıklı güven artırıcı ve stratejik bağlamda ilişkiler kurmak için Çin ’e davet ettiğini de bildiren Ven, “İki ülke terörizmle ve aşırıcılıkla mücadelede karşılıklı mekanizmalar kurarak, bu konularda ortak çalışma yapma kararı almıştır” dedi. Çin tarafı iki ülke arasındaki ticaretin “sürdürülebilir ve dengeli” bir şekilde geliştirilmesi için çalışmalar yapacaklarını söyleyen Ven, ülkesinin demiryolu, köprü ve enerji konularında Türk tarafı ile yoğun işbirliği yapacağını belirtti. Türkiye’nin bölgesinde ve uluslararası camiadaki etkinliğini ve gücünü teslim ettiklerini kaydeden Ciabao, Türkiye’nin İran konusunda yaptığı çalışmaları da takdirle karşıladıklarını söyledi. 2009 yılında Türkiye’nin Çin Halk Cumhuriyeti’ne ihracatı 1 milyar 599 milyon dolar olarak gerçekleşti. Bu ülkeden ithalatımız ise 12 milyar 655 milyon dolar oldu. 2009 yılında dış ticaret hacmimiz 14 milyar 254 milyon dolar düzeyinde gerçekleşti. 2010 yılının ilk 8 ayında ise Türkiye’nin Çin ’e ihracatı, geçen yılın aynı dönemine oranla yüzde 62.8 artarak 1 milyar 451 milyon dolara ulaştı. Anılan dönemde ithalatımız ise yüzde 37.9 artışla 10 milyar 670 milyon dolar oldu. 2010 yılında ilk 8 aylık döneminde Türkiye ile Çin arasındaki ticaret hacmi ise 12 milyar 121 milyona ulaştı. DIŞ Ekonomik İlişkiler Konseyi (DEİK) Türk-Çin İş Konseyi Başkanı Hüsnü Özyeğin, Türkiye ile Çin arasındaki ticaret hacminin artmasının her iki ülke ekonomisine katkı sağladığını söyledi. Türkiye’nin Çin ’den yaklaşık 12 milyar dolarlık ithalatında tüketim mallarının sadece dörtte bir oranında yer tuttuğuna dikkat çeken Özyeğin, “Çin’den toplam ithalatımızın yüzde 11’i tekstil ürünleri, yüzde 15’i de tüketim ürünleri. Geri kalanın büyük bir kısmı Türkiye’nin ihracatının artmasını sağlayacak yatırım malları ve ara mallar. Bu nedenle Türkiye ile Çin arasındaki ticaretin artması Türkiye ekonomisine katkı sağlıyor” diye konuştu. Özyeğin, Çin yatırımları konusunda kamunun yanında özel sektörün de muhatap alınması gerektiğinin altını çizdi. Çin ’in, Uluslararası Para Fonu (IMF) 2010 yılı Dünya Ekonomik Görünüm raporu verilerine göre, 2010 ve 2011’de yüzde 10’un üzerinde büyümesi bekleniyor. ABD’den sonra dünyanın ikinci büyük ekonomisi olan Japonya’yı 2011’de yerinden etmesi beklenen Çin ’in, 2010 yılında Gayri Safi Yurtiçi Hasılası (GSYH) 5.7 trilyon dolar olacak. 14.6 trilyon dolar ile ABD dünyanın en büyük ekonomisi olurken, Japonyanın 2011’de 5.4 trilyon dolar ile üçüncü sırada yer alması bekleniyor. IMF verilerine göre Çin , 2011’de 6.7 trilyon dolar GSYH elde edecek. Bu rakam 2015’te 10 trilyon dolara çıkacak. Türk ve Çin silahlı kuvvetleri ilk kez ortaklaşa hava tatbikatı Türkiye'de gerçekleştirdi. Tatbikatta Türkiye F-4 savaş uçakları kullanırken, Çin hava kuvvetleri Rus yapımı SU-27’lerle uçtu. Çin ordusu ilk kez bir NATO ülkesinde tatbikat yaptı. Şanghay Expo 2010 fuarında Türk Pavyonu’nun açılış töreni Kültür Bakanı Sayın Ertuğrul Günay, ÇHC Kültür Bakan Yardımcısı Chen Xiaoguang, Sayın Büyükelçi Murat Salim Esenli ve Şanghay Başkonsolosumuz Murat Ülkü’nün katılımıyla 20 Haziran 2010’da gerçekleştirilmiştir. Açılış töreninde "Anadolu Ateşi" dans grubu bir gösteri sergilemiştir. Expo boyunca ülkemizi tanıtıcı çok yönlü kültürel etkinlikler düzenlenmiştir. Expo Pavyonumuza bugüne kadar 6 milyon ziyaretçi kabul etmekten büyük memnuniyet duyuyoruz. Bu sayede Çin vatandaşları Türkiye hakkında ilk elden bilgi sahibi olma fırsatı bulmuşlardır. Şanghay Expo fuarı 31 Ekim 2010 tarihinde sona erecek, fuarın kapanışına Dışişleri Bakanımız Sayın Ahmet Davutoğlu katılacaktır. "Şimdi önümüzde de son derece önemli ve tarihi önem taşıyan bir ziyaret vardır. O da Çin Başbakanı Sayın Wen Jiabao'nun ülkemize yapacağı ziyaret. Bu ziyaret, yine tarihi özellikte. Sebebine gelince, 8 yıl aradan sonra, Çin Halk Cumhuriyeti'nden Türkiye'ye yönelik başbakan düzeyinde bir ziyaret. Sayın Başbakanımız Recep Tayyip Erdoğan, meslektaşı Wen Jiabao'yu heyecanla bekliyor." "Bunların bizim açımızdan şöyle bir önemi var，her kademede, her alanda en üst düzey yetkililer birbirleriyle görüş alışverişinde bulunuyorlar ve bu görüş alışverişinin ana unsuru da, mevcut ilişkilerimizi nasıl daha hızlı bir şekilde geliştirebiliyoruz... Ve zaten Cumhurbaşkanımızın Çin'e yapmış olduğu ziyarette, iki ülke liderleri şunu kararlaştırdılar: İlişkilerimizi yeni bir düzeye çıkaralım. Ve biz de bu karar doğrultusunda hareket ediyoruz." "Biz, Sayın Devlet Bakanımız Zafer Çağlayan'ın daha önce Çin'e yaptığı ziyaret sırasında söylediği gibi, Çin'i bu konuda bir tehdit olarak değil, tam aksine bir fırsat olarak görmeliyiz ve görmek için gayret sarfetmeliyiz. Biz de bu yönde işadamlarımızı teşvik etmiştik ve işadamlarımızın artık Çin'e bir tehdit değil, bir fırsat olarak bakmaya başladıklarını görüyoruz. Ortak işbirliği alanlarını araştırdıklarını görüyoruz." "Tabii ki, aslında iki ülkenin ilişkilerinin, kültür bence en önemli boyutlarından birini oluşturuyor. Çünkü, İşadamları, ekonomi boyutuyla ilgileniyorlar, ticaret boyutuyla ilgileniyorlar. Biz diplomatlar her konuyla ilgileniyoruz, görevimizin tabii tanımı itibariyle. Fakat kültür dediğimiz anda, ilişkilerimizi insandan insana bağlantıya dönüştürüyoruz ve hakikaten ilişkilerin mutlaka halklara malolması, o ilişkilerin geleceğiyle ilgili çok önemli bir unsuru mutlaka bünyesinde barındırıyor. Çünkü halklar birbirlerini iyi tanırlarsa, halklar birbirlerini severlerse, o zaman ilişkiler de o doğrultuda hızla ilerliyor." Her alandaki ilişkilerde hem Çin'in, hem de Türkiye'nin medya kuruluşları önemli rol oynadı ve katkıda bulundu. Bu yıl Çin Uluslararası Radyosu (CRI) Türkçe Servisi'nin Silktrek adlı websitesi açıldı, Türkçe ve Uygurca yayınları Türkiye'de dinleniyor ve Türk dinleyiciler tarafından beğeniliyor. Büyükelçi Esenli, CRI'nın iki ülke arasındaki temasların güçlendirilmesi için yaptığı katkıyı olumlu değerlendirdi. "China Radio İnternational (Çin Uluslarararası Radyosu) hakkikaten iki ülke ilişkilerinin gelişmesi için çok gayretle çalışan bir kurum. Bir kere bize gösterdiğiniz ilgiden ötürü, ben teşekkür etmek istiyorum." 2011 yılında Çin ile Türkiye arasındaki diplomatik ilişkilerin 40'ıncı yıldönümü kutlanacak. Büyükelçi Esenli, iki ülkenin bu fırsattan yararlanarak, ikili ilişkileri daha da geliştirmesi gerektiğini ifade etti. "2011 yılı, belirtiğiniz gibi, ikili ilişkilerin kuruluşunun 40. yılı olacak. Ve bu ilişkilerin 40. yılı olması, tabii bize yeni bir ivme veriyor. Ancak, tabii tek başına 40. yılla hesaplamıyoruz bu doğrultuda. Bunun ötesinde de bazı planlarımız var. 2012 yılını, Çin Halk Cumhuriyeti'nin tanıtımı açısından Türkiye'de Çin Yılı, 2013 yılını da Türkiye'nin Çin'de tanıtımı açısından Çin'de Türkiye Yılı olarak belirledik. Böylece önümüzde bizim birbirimizi daha iyi tanımaya yönelik neler yaptığımızı, ne noktaya geldiğimizi daha iyi anlatabileceğimiz çeşitli platformların oluşacağı bir döneme doğru ilerliyoruz. Ve bu üç yıllık dönem içerisinde hakikaten yine daha önce sorularınızda belirttiğim gibi, iki ülke insanın birbirlerini daha iyi anlaması ve daha iyi tanıması için bir vesile olarak görüyoruz." Shanghai EXPO 8 Ekim 2010 sabahına kadar yaklaşık 60 milyon ziyaretçiyi ağırladı. EXPO'nun organizasyonundan sorumlu bir yetkili, daha önceki fuarlardan elde ettiği deneyimler sonucunda, EXPO'nun kapanacağı tarihe doğru büyük bir ziyaretçi akının meydana geleceğini tahmin ettiğini söyledi. Yetkili, bu nedenle ziyaretçilerin mümkün olduğu kadar EXPO'ya erken gelmeleri önerisinde bulundu. Çin tarafından düzenlenen ilk dünya fuarı Shanghai EXPO, altı ay açık kaldıktan sonra 31 Ekim'de sona erecek. "Türkiye Pavyonu en sevilen pavyonlardan biri"
Pavyonu Yüksek Komiseri Büyükelçi Sencar Özsoy, Türkiye Pavyonu'nun fuar alanındaki en sevilen pavyonlardan biri olduğunu belirtti. Sencar Özsoy, Çin Uluslararası Radyosu'na bugün (26 Mayıs) verdiği özel demeçte, fuarın açıldığı 1 Mayıs günüyle birlikte Türkiye Pavyonu'nun ziyaretçileri ağırlamaya başladığını söyledi. Özsoy fuarın ikinci gününün sonunda, Çinlilerin uğurlu saydıkları ve "gelişme-zenginleşme" anlamını veren beş adet "8"den oluşan 88 bin 888 ziyaretçinin pavyonu ziyaret ettiğini hatırlattı. Şu ana kadar yaklaşık 700 bin ziyaretçinin Türkiye Pavyonu'nu ziyaret ettiğine dikkat çeken Özsoy, "Hiç abartmadan, Türkiye Pavyonu'nun fuar alanındaki en sevilen payvonlardan biri olduğunu söyleyebiliriz" dedi. Ziyaretçiler, Türkiye Pavyonu'nda Maraş Dondurması'nın tadına bakabiliyor, hat ve ebru sanatlarıyla ilgili gösterileri izleyebiliyor ve nazar boncuğu satın alabiliyorlar. Bütün bunlar, ziyaretçilerin Türkiye Pavyonu'na akın etmesine neden oluyor.